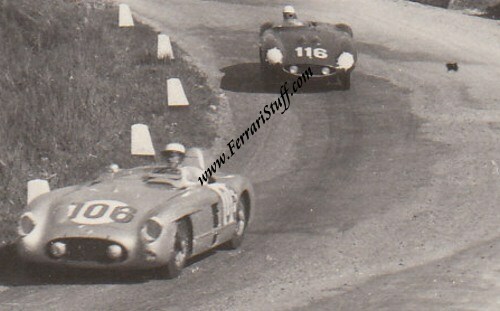 Vintage 1955 Photo of Ferrari 857 Sport S/N 0570M, Targa Florio. 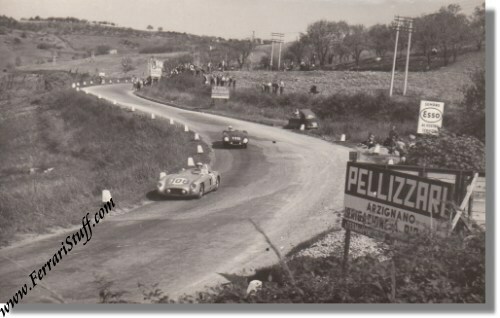 This is a vintage 1955 photo of the Ferrari 857 Sport Spyder Scaglietti, S/N 0570 M, during the 1955 Targa Florio. The car would finish the race in 3rd position, driven by Eugenio Castellotti and Robert Manzon. After this race Ferrari sold the car to the USA where it still seems to linger but missing its original engine. In the foreground we see the # 106 Mercedes-Benz 300 SLR (S/N 0005/55) of Desmond Titterington and John Fitch who would finish the race in 4th position. The photo measures some 5.5 x 3.5 inches or 13.5 x 9 cm and is in excellent condition. The back carries the photographer's stamp.